2. If there is a hood covering the barrel remove the hood. 3. Unwind spring(s) unless the spring or springs are already broken. Mark the tension wheel and count the number of turns you remove. You’ll need to rewind the spring the same number of turns and possibly a little more. 4. Free the drive hand chain if there is no operator. 5. If there is an operator, remove the final drive chain. 6. Suspend the operator if it is attached to end plate. 7. Check to confirm the barrel turns freely. 8. Remove bolts that secure the top of the curtain to the barrel. 9. Support barrel in middle with forklift blades separated as far as possible, checking to assure there is adequate clearance above the barrel. If there is not enough clearance, stack pallets and lift these in place to support the barrel. 10. Secure the barrel with a rope or strap to prevent it from rolling off the blades or pallets in the following steps. 11. Remove the two or three bolts on each side which secure the end plates to the vertical angle. Raise the forks as needed to free the bolts. 12. It is now time to lower the barrel. Important! Remember that the weight in the barrel is not evenly distributed because the springs are off to one side. As you pull the barrel away from the header, the winding side will be heavier and it may possibly drop. Support this end as needed with a rope, straps, or by hand as a second person walks this end down a ladder.13. Lower the barrel to the floor with the bottoms of the end plates on the floor and the endplates supporting the barrel. 14. Check the drive end to confirm it is OK. This end usually does not have a problem. If it does need repair support this end of the barrel with blocks or pallets, remove the drive chain, and remove the fasteners that secure the drive end to the end of the barrel. Sometimes this is welded and you will need to grind off the welds. 15. If the drive end is OK, go to the winding end and remove the bolts, screws or pins that secure the internal cones and winding end plug to the barrel. There will usually be three at the winding end of the barrel, and three similar fasteners a third to halfway toward the center of the barrel. Rotate the barrel as needed to locate the fasteners. If there are two sets of springs, there will be three additional fasteners further toward the other end of the barrel. In the drawing below is what is typically found in a barrel. If there is only one spring there will be more parts. If there are more springs there will be more parts. Notice that the shafts are not connected. 16. To confirm that all the internal plugs are free, turn the winding wheel one or two turns and see if the spring assembly spins inside the barrel. Tap the end cone away from the bearing as needed to free the cone. 17. Remove the pin or other fasteners that secure the winding wheel to the winding shaft. 18. Support the winding end with blocks or pallets and remove the end plate. 19. Pull the spring assembly out of the barrel. 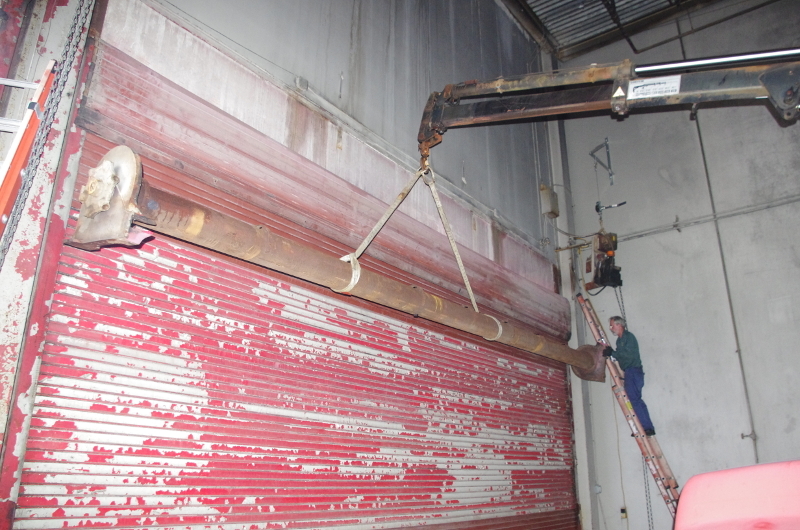 It may be necessary to secure the drive end and pull the winding out with a come-along, chain fall or forklift. 20. If you have a broken spring or springs, measure and order the springs. 21. Check all the other spring assembly parts for wear or damage. 22. To replace the springs, heat ends of the wire to cherry red and bend the first end as needed to match the shape of the old spring. To secure the other end stretch the spring with a come-along and a strap wrench, and then bend the end properly so it secures to the cone. 23. To complete the job, reverse the order. When sliding the spring assembly into the barrel align the cone holes with the barrel holes to make them easier to find when securing them.